Welcome to Western Field Ornithologists. If you are not a member and want to know what's happening with WFO, sign up for our newsletter. Members receive newsletters automatically. We value your privacy! Your information will be used only to sign up for our newsletter and to receive an e-copy. WFO promotes the study, appreciation, and protection of birds in western North America. Membership in WFO is by calendar year. 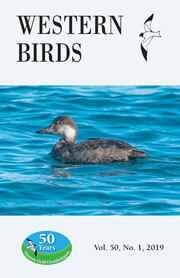 You will receive all four issues of Western Birds in one volume. Your membership acknowledgement will provide the details. Included is member-only access to all of the Western Birds volumes online. We now accept Visa or Mastercard on our secure site.